Cryotherapy at its most basic works on the same principle as an icepack on a sore knee. Just like the icepack helps relieve the pain on a bump, cryotherapy is used to relieve symptoms in people suffering from muscular and joint pains resulting from intense activity or injury. The therapy helps your body recover from intense exercises by flushing your muscles and delivering nutrients and oxygen to them. Whole Body Cryotherapy (WBC) improves muscular resistance to fatigue and increases muscles’ capacity to regenerate which has been proved to enhance muscle performance. 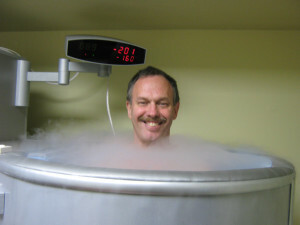 Cryotherapy has successfully been used across Europe and the U.S.A. to ease depression signs. The process is believed to trigger the release of endorphins and adrenaline into your blood stream. Release of endorphins has always been associated with decreased stress and low levels of both irritability and anxiety. Endorphins increase energy levels and will leave you euphoric for up to 8 hours. These “euphoric” endorphins normally increase quality of sleep. As competitiveness and training sessions in sports become increasingly intense, we need to work even harder to keep our athletes healthy. Cryotherapy currently provides the best alternative for sports and injury recovery.